Be a leader of the First Order Stormtroopers, just like Captain Phasma! This Star Wars: Episode VII - The Force Awakens Captain Phasma Troop Leader Logo 18 oz. Oval Ceramic Mug features the villain's shiny helmet in front of the Power logo. 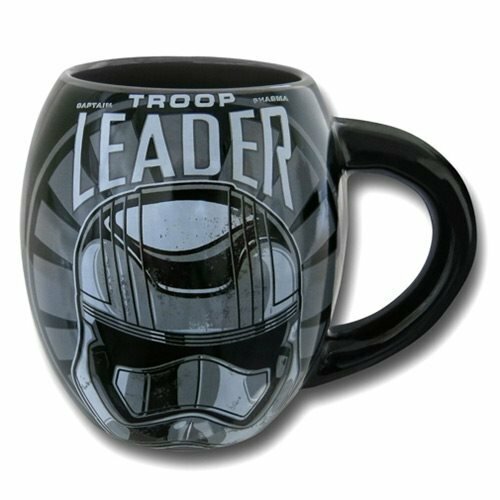 Complete with the words "Troop Leader," this great oval mug holds up to 18 ounces of liquid! Hand wash only. Not dishwasher safe. Do not microwave. Measures approximately 4 1/4-inches tall x 3 3/4-inches in diameter. Ages 14 and up.